On a dull, grey winter morning, inside a nondescript apartment building, something magical is taking place. Dressed in a long dark dress and a black hijab, teacher Enas Almasalmeh walks around the bare room that acts as a makeshift classroom. Smiling children sit at long tables organized in a U shape, and practise writing a letter from the Arabic alphabet in their notebooks. 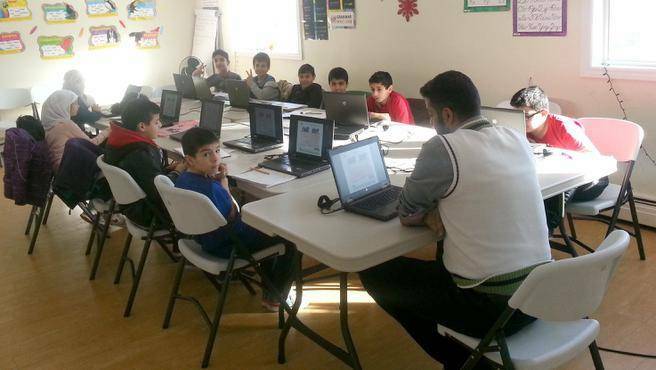 Every Sunday morning these children, most of whom fled Syria with their families, come from across Halifax and surrounding areas to learn the Arabic language and culture in a safe place, far from civil war. “I feel happy inside,” said Almasalmeh in broken English, referring to the feeling she has seeing children learn to read and write in Arabic. Last September, the school, now known as the Syrian School, was started after Almasalmeh’s husband, Loai Al Rifai (pictured), realized that the first thing his children and the other Syrian children he met would lose was their first language. “We want to teach our language and our culture and how to integrate our kids into Canadian culture,” said Al Rifai, the school’s founder. The school, which holds classes on Saturdays and Sundays, now has more than 100 students ages six to 12. On Fridays, teenagers can take a class in computers. On a recent Sunday morning, Almasalmeh teaches the class of children, between the ages of six and nine, how to pronounce an Arabic letter and some words that include this letter. Her own four-year-old daughter listens in on the lesson. When the language lesson is done, she talks about Syrian culture and Arabic traditions. One topic they cover is creating strong bonds between family and friends and the importance of maintaining that tradition while learning new ones in Canada. Teaching is new to Almasalmeh. In Syria, she was a doctor, with a specialty in dermatology. The seven other teachers at the school are made up largely of doctors, teachers and engineers, who haven’t been able to get jobs in their professions since arriving in Canada as refugees. Memories of the Syrian civil war are vivid. Sometimes when doing art in class, the older children will draw images of airplanes firing missiles and bloody bodies lying on the ground, he said. Most of the school’s children are from Syria, but some come from Jordan and other Arabic-speaking countries. Both Christians and Muslims can attend. Any child who wants to learn Arabic is welcome, Al Rifai said. Parents pay $10 for their child to enrol. The teachers are volunteers, so the money is used to buy pencils and other supplies. Killam Apartment REIT offered the ground-floor apartment in Halifax’s Clayton Park neighbourhood for free. Efforts are being made now to find the school a more permanent space. Todd McDonald, co-founder of the Give to Live charity, which privately sponsored Al Rifai and his family to come to Nova Scotia, was so inspired by Al Rifai’s commitment to help the Syrian community that his company, Energy Atlantica, donated $10,000 to the school. McDonald is in talks now with the Halifax Regional School Board to use classrooms in a school on weekends, giving the Syrian students proper desks and white boards. Al Rifai and his wife Enas arrived in Canada in November 2016. Three years earlier they fled their home in Daraa, a city located about 13 kilometres north of the border with Jordan. They left everything behind. In Syria, Al Rifai was a surgeon. “Our life was not stable in Jordan,’ he said. 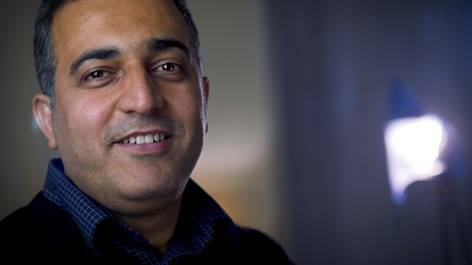 Arriving in Canada as refugees, Al Rifai now works at Home Depot to support his wife and their two children, two and four years old. He also takes an English language course at Dalhousie University and on weekends teaches at the school. Initially, McDonald offered to give Al Rifai $10,000 so he could pursue his dream of practising medicine in Canada. Touched by the gesture, Al Rifai declined. Instead, he asked if the money could be used to start the Syrian School. “First, we must help these other people that are much worse off than us,” McDonald said, referring to Al Rifai’s response to his monetary gift. Plans are underway to continue growing the school. English and computer classes will be offered to adults and in February a GoFundMe campaign, with a tentative name of “Bank of Karma”, will be launched. With a goal of raising $50,000, the money will be used to help Syrian adults find meaningful employment, McDonald said. Samer Almsleh Almsalemah is happy to be back in a school. On the recent Sunday morning, in another make-shift classroom in the room next to Enas Almasalmeh, Almsalemah, who was a teacher in Daraa, Syria, leads a roomful of children ages nine and 10, through an assignment in Arabic on the laptops in front of them. 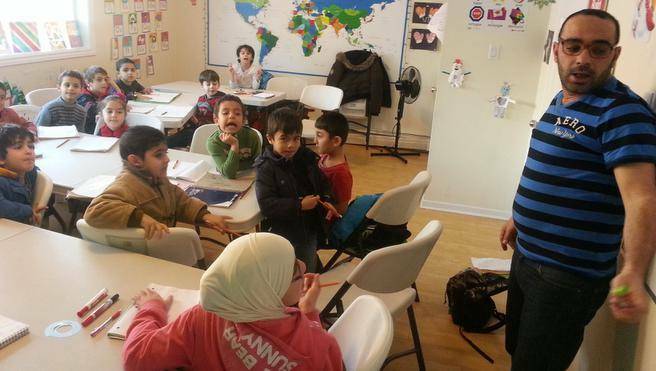 Forced to move 20 times before arriving in Canada a year and a half ago, Almsalemah said his children didn’t receive a consistent education during that tumultuous time. He is happy that both the Syrian School and the public school system can provide them with one now. While he dreams of eventually finding a paid teaching job, for now it feels good to be doing what he was trained to do. Speaking little English, finding work in Halifax has been difficult. He recently worked on a scallop boat but suffered sea sickness. Like Almsalemah, Enas Almasalmeh knows that her road to finding meaningful employment, and practising medicine in Canada will be a long, hard one, but she isn’t deterred. “I will not give up my dream,” she said smiling. Looking ahead, Al Rifai believes the school’s value within the Syrian community and its children, will extend far beyond today.